(1850)^*# - View showing a model of Los Angeles as it appeared in 1850. Looking northeast, the layout of the new city can clearly be seen with the Los Angeles Plaza located in the lower left-center. The large white structure to the left of the Plaza is the Old Plaza Church. The two streets running from bottom of photo to the Plaza are Main Street on the left and Los Angeles Street on the right. Alameda Street runs from the lower right corner diagonally toward the lower center of photo. The L.A. River can be seen running from the lower-right diagonally to the center of the photo, turns left and disappears behind the mountain. At that point the Arroyo Seco can be seen at its confluence with the LA River. The tall majestic San Gabriel Mountains stand in the far background. Vineyards blanket the area between the City and the L.A. River (lower right). The large dark spot in the lower-right of the photo is El Aliso, the historic landmark of the indigenous Tongva people who once lived in the Indian Village of Yangna at that location, adjacent to the Los Angeles River. In 1841, Los Angeles’ first census shows a population of 141. California’s first discovery of gold a year later (1842) at Placerita Canyon, near Mission San Fernando, prompted LA’s first population boom. By 1850, Los Angeles' population reached 1,610. (ca. 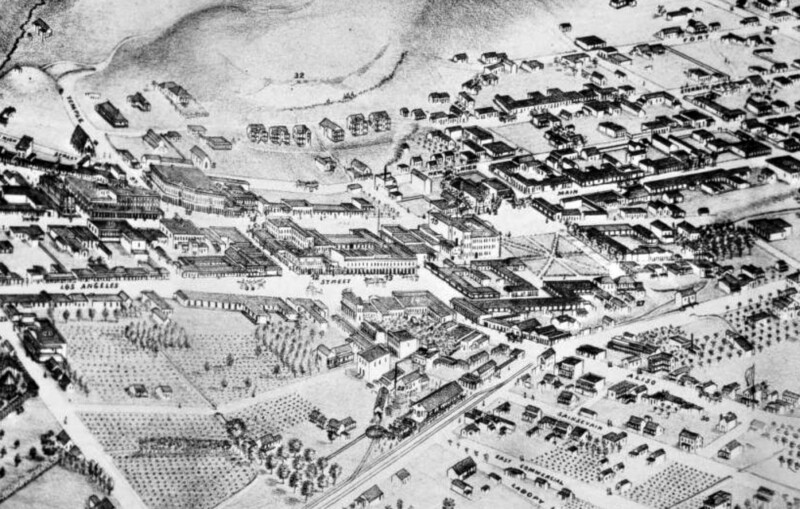 1850)^** - Photo of a sketch showing the LA Plaza and surounding area as it appeared in 1850. The Old Plaza Church is seen in upper left. The map is based on the 1849 Ord Survey. Click HERE to see more in an Interactive Map of Early Los Angeles as it appeared in 1850. (ca. 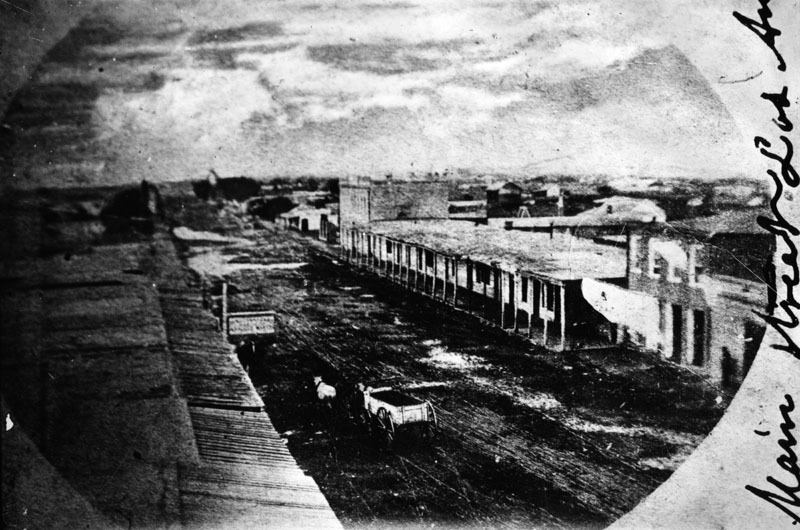 1858)* - This is the earliest known close-up photograph of the Los Angeles Plaza. There is a square main brick reservoir in the middle of the Plaza, which was the terminus of the town's historic lifeline: the Zanja Madre ('Mother Ditch'). The reservoir was built in 1858 by the LA Water Works Company. (ca. 1860)* - One of Los Angeles' first water reservoirs was the brick structure shown in the center of the Plaza. The adobe directly behind was owned by Augustin Olvera. The 3-story building behind was the Sisters of Charity Hospital. * Click HERE to see more in Early LA Water Reservoirs. 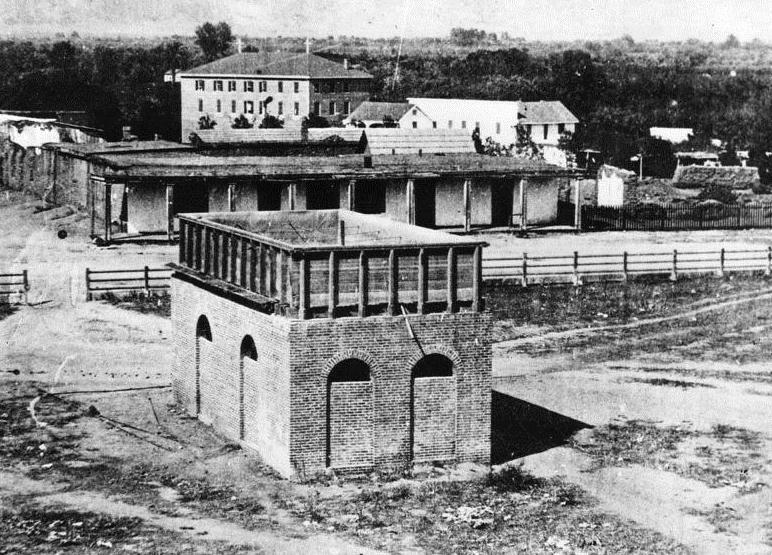 In 1858, the LA Water Works Co., headed by William G. Dryden, constructed a large brick and wood storage tank in the center of the city plaza. It would remain there for about 10 years and then be replaced by a fountain. Water would continue to be stored in other tanks on the periphery of the plaza as well as in other nearby reservoirs. In 1876, the Buena Vista Reservoir in Elysian Park was built by the privately-owned Los Angeles Water Co. The LA Water Co., headed by John S. Griffen, Solomon Lazard, and Prudent Beaudry, signed a 30 year lease franchise agreement with the City to run its water system (1868 - 1898). Click HERE to read more in Water in Early Los Angeles. (1863)^ - A water wheel on the Los Angeles River at start of Zanja Madre, LA's original aqueduct. The river has been the life-source of Los Angeles since it was settled in 1781. 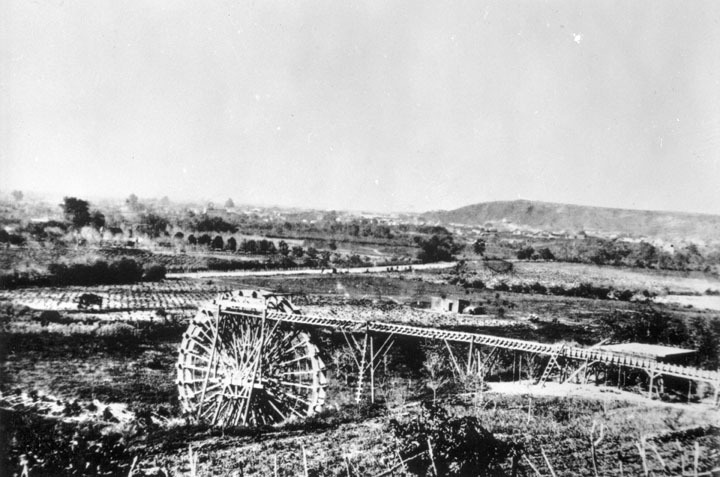 The 40 ft. water wheel seen above was used to raise a portion of the Los Angeles River water supply to a height permitting gravity flow to homes, fields and storage. In 1857, William Dryden was granted a franchise by the City Council to construct a system to provide a water supply. Under this system a brick reservoir was built in the center of the plaza to store the water brought to it by the Zanja Madre. A water wheel was also constructed to lift the water from the river to the Zanja Madre. Water then was distributed to a number of houses along the principal streets through a system of wooden pipes. Click HERE to read more about William Dryden. (1868)^ - This manuscript map traces the path of the essential lifeline of early Los Angeles: the Zanja Madre, or Mother Ditch, prepared by cartographer William Moore. (ca. 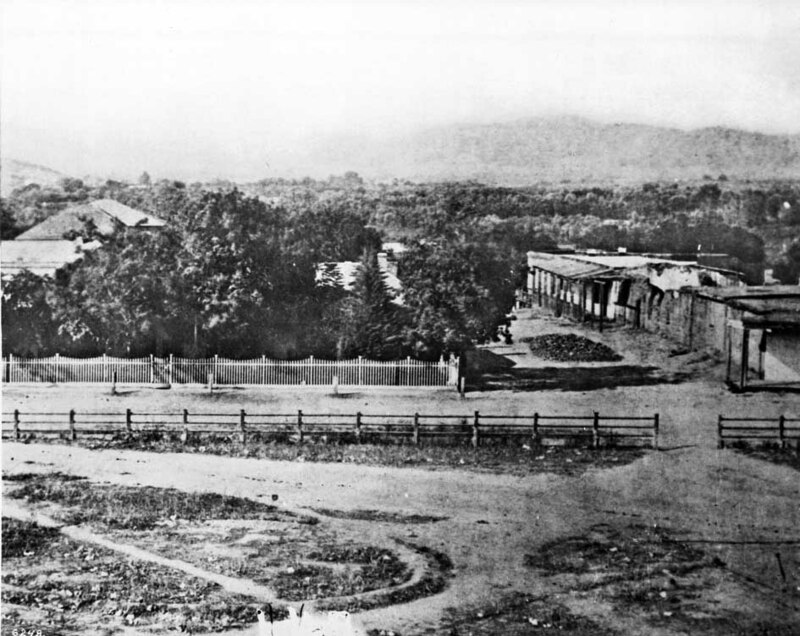 1868)^ - The Plaza, looking east, with LA's first above ground reservoir to the right of the picture. The two-story building directly behind the reservoir is the Vincent Lugo Adobe. The building in front of the reservoir with the gazebo-like tower is the 'Old Plaza Church'. 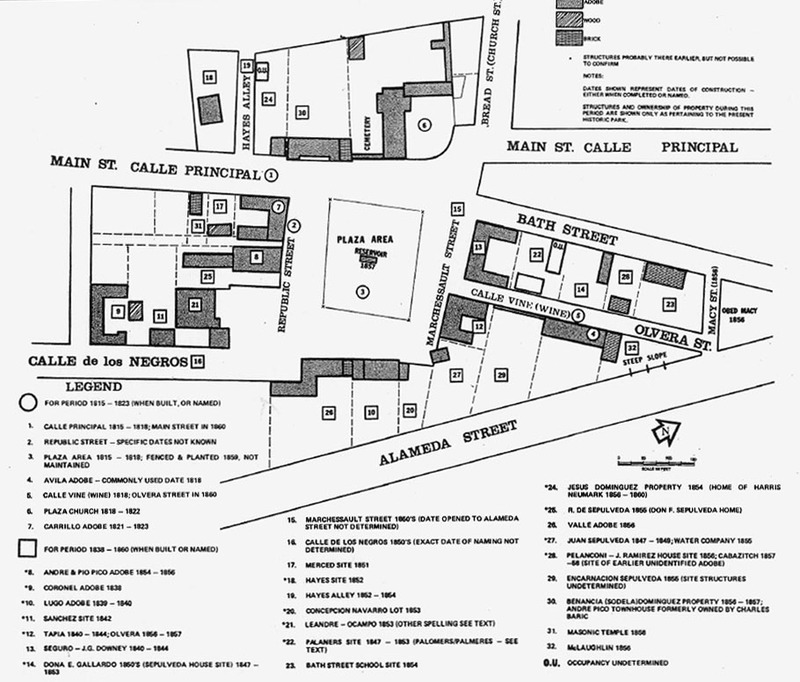 (n.d.)^#*^ - Map showing the LA Plaza area as it appeared in 1860. Adobe structures are predominately on all sides. Click HERE to see more in Early Views of the Los Angeles Plaza. (1860)^ - A view of north Broadway from Fort Hill. A small cluster of homes line the unpaved street. Fort Moore was an historic U.S. Military Fort during the Mexican–American War. Its approximate location was at what is now the Hollywood Freeway near the intersection of North Hill Street and West Cesar Chavez Avenue, downtown. The hill on which it was built became known as Fort Moore Hill, most of which was removed in 1949 for construction of the freeway. The hill was located one block north of Temple Street and a short distance south of present day Cesar Chavez Avenue, between the Los Angeles Civic Center and Chinatown. (ca. 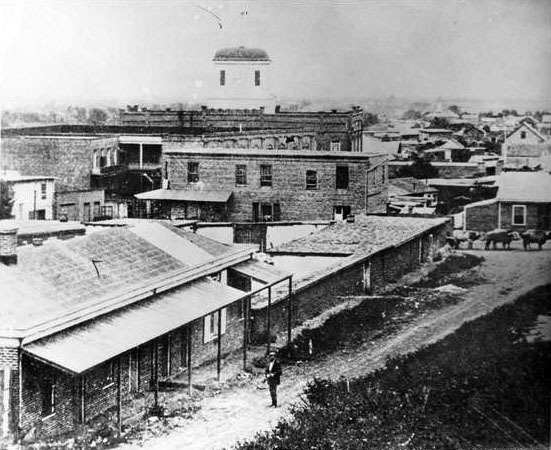 1860)^ - View of Aliso Street east of Los Angeles Street, looking west from near Alameda Street, circa 1860. At the time this was the principal thoroughfare to the Pueblo. 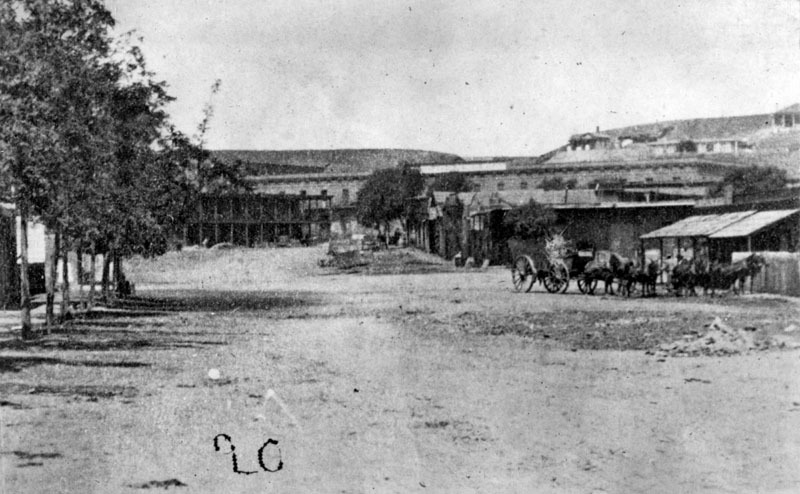 Low buildings, trees, and horse-drawn vehicles are seen. 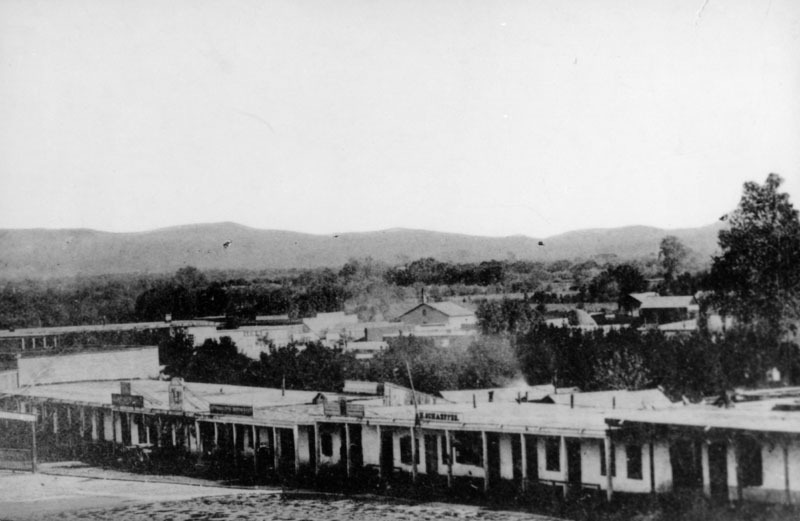 (1868)^ - View of the adobe buildings on Main Street in from Temple Block in 1868. 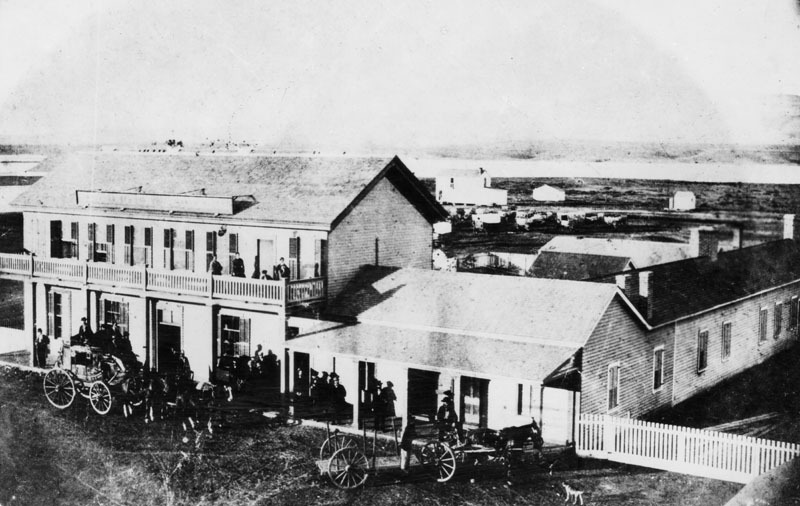 (1868)^ - View taken from the top of the U.S. Hotel on Main and Requena streets in 1868. View is looking east from Main. Willow trees in background, are on the banks of the Los Angeles River. (ca. 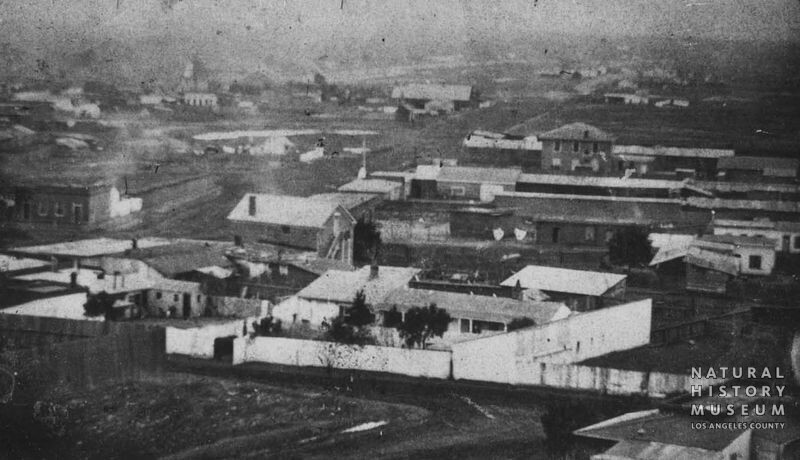 1860s)+^ - Panoramic view looking south showing Spring Street School (first public school in Los Angeles). It is the 2-story building with three second-floor windows seen in the upper center-right and located near the northwest corner of 2nd and Spring streets. (1869)* - Early view of Commercial Street, looking east from Main Street, just north of Temple Street, near the site of the later City Hall. On the right is Polaski and Goodwin's Dry Goods Store, sold to them by I.W. 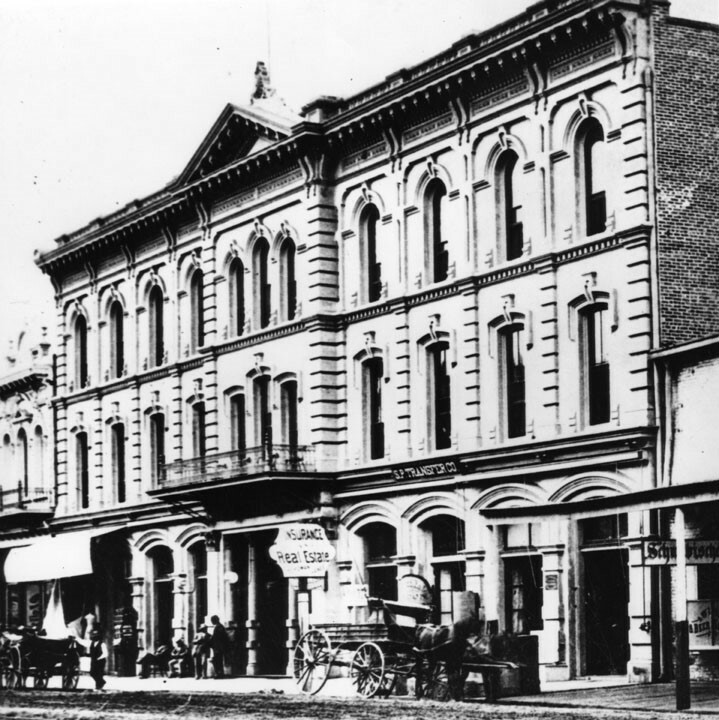 Hellman in 1868, and where the Farmers and Merchants Bank did business for years. Charles Ducommun operated a jewelry and hardware store in the building in left foreground. In the background is Herman Heinsch's Saddle and Harness shop, a newly-erected brick building. What appears to be a gas street light is in the right foreground. 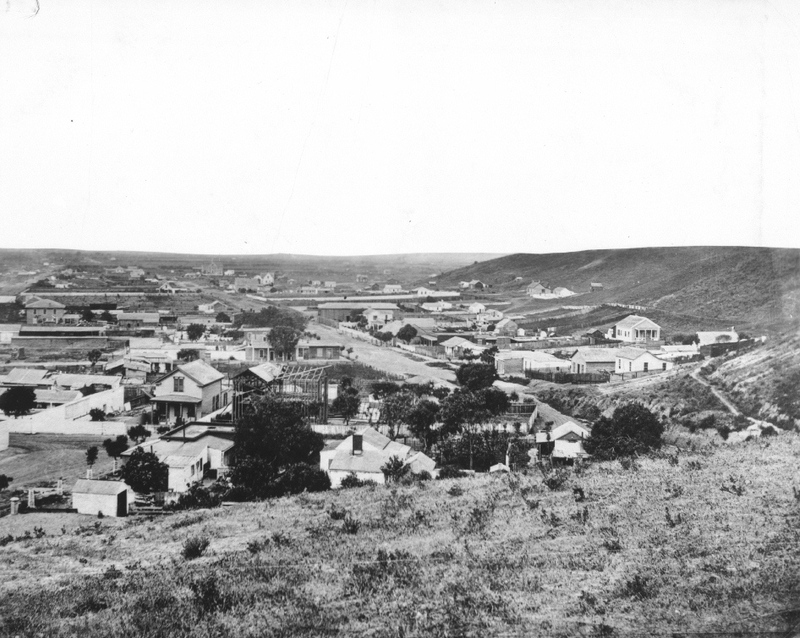 (1868)^ - View looking south from ‘Poundcake Hill’. Broadway is the main street in the middle of the photo. (1868)^ - Same photo as shown above but with buildings and key areas identified by numbers (see below). (ca. 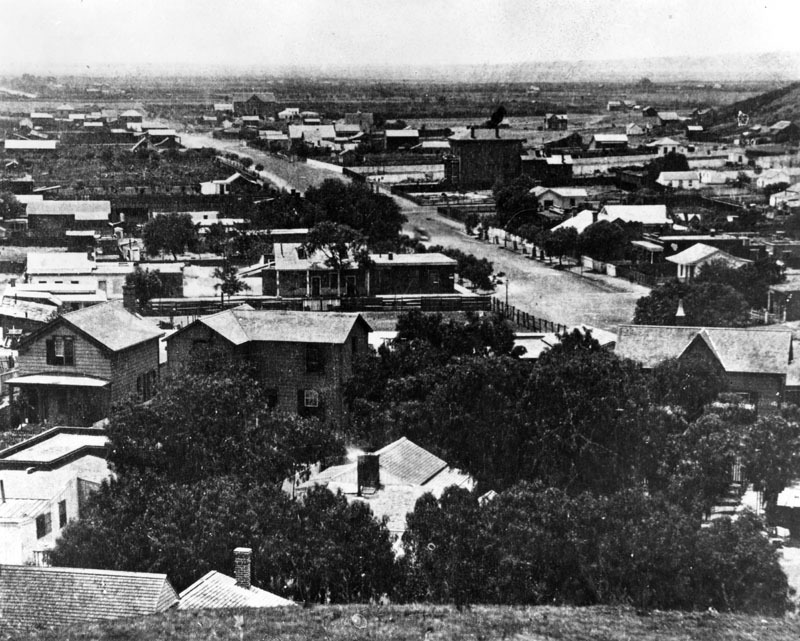 1870)^ - View of Broadway looking south from near Temple Street. The large building to the right rear was St. Vincent's College, facing 6th Street between Broadway and Hill Street. (1870)^ - View in 1870 of Main Street, north of Commercial Street. At left is Theodore Wollweber's Apothecaries Hall at 59, with its symbol on a pole in front, W.M. Buffum's Wines & Liquors, Republican Printing Office, and the S. Lazard & Co. foreign and domestic dry goods store, wholesale and retail, at 53. 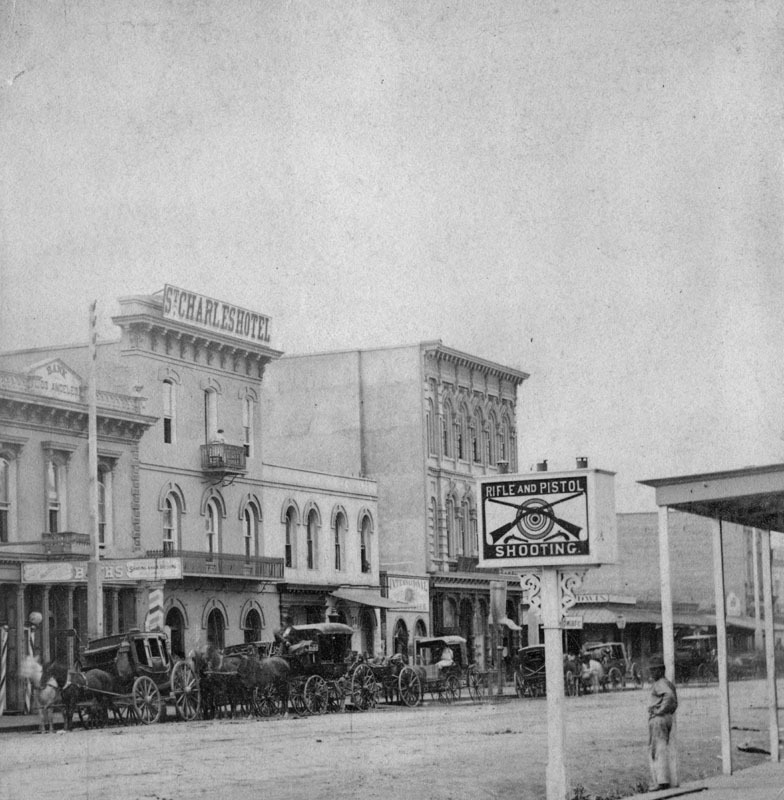 At left, on the corner of Main and Commercial, is the store purchased in 1865 by I.W. Hellman, 22 years old, from Adolph Portugal. Horse-drawn vehicles are waiting in the street. A gas lamp is behind them. 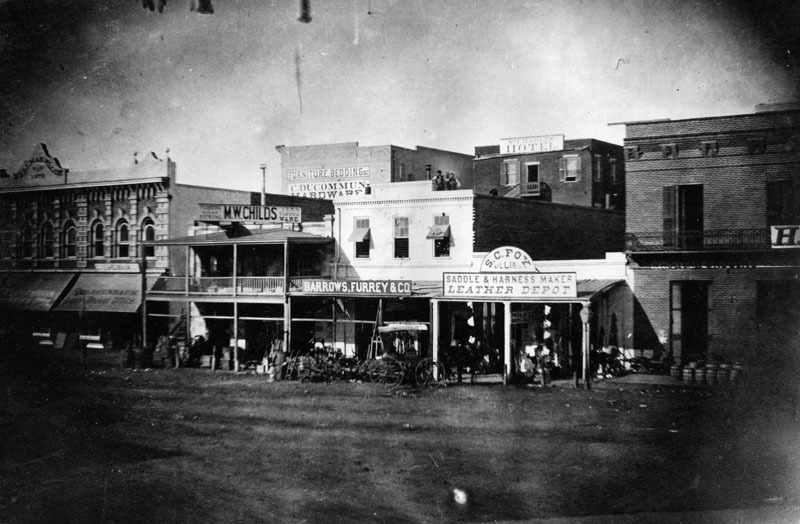 (1870)* - Main Street view of the Downey Block, located on the N/W corner Temple and Main streets. 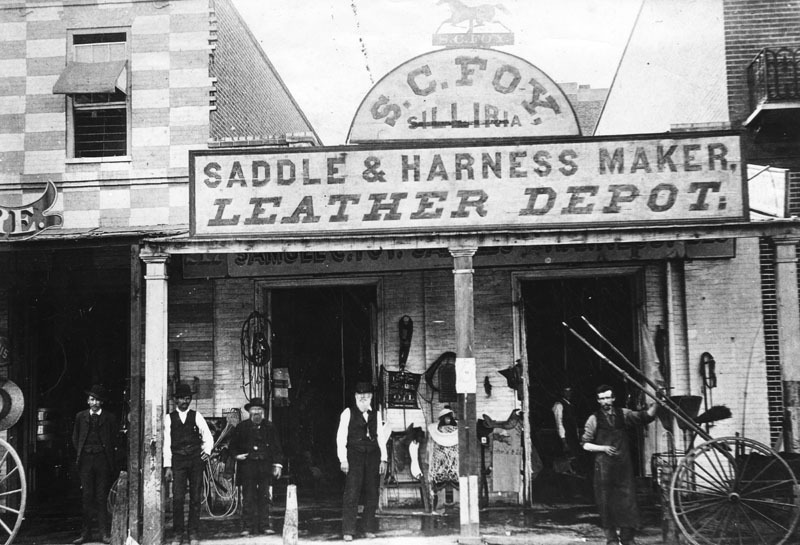 Horse-drawn wagons are parked in front of storefronts with their prominent signs displayed high above where everyone can see. 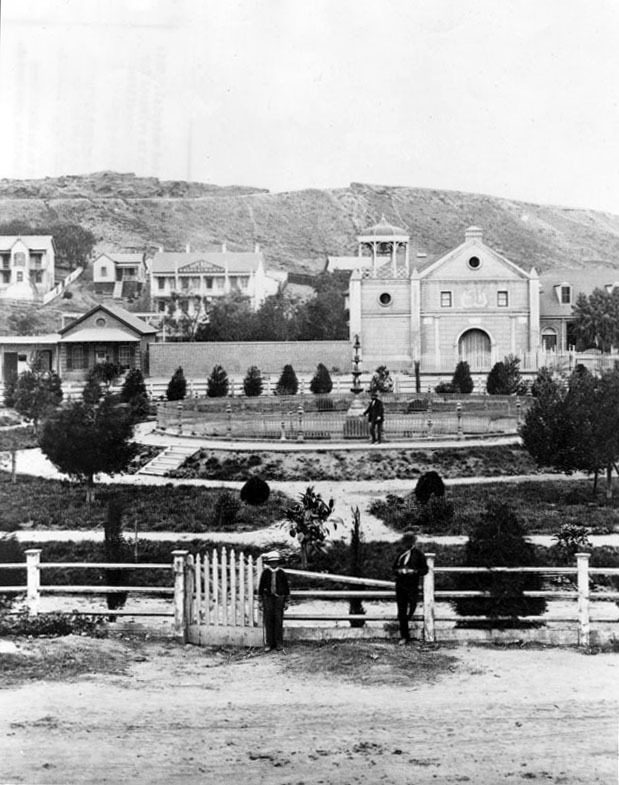 (1869)^ - Panoramic view of the Plaza and 'Old Plaza Church' (Mission Nuestra Senora Reina de Los Angeles). The square main brick reservoir in the middle (partial view) was the water reservoir builit by William Dryden and his LA Water Works Co. Click HERE to read more on Wiliam Dryden. The building in the top right background was the Sisters of Charity Hospital. The three adobes seen on the north side of the Plaza were owned in 1869 by M. Norton (built 1854), John Downey (shrouded by trees, built 1844) and Augustin Olvera (built 1854). They are all gone now. The first lost to the widening of Main St, the second torn down in 1894 to build the Simpson-Jones Building and the last demolished in 1916 and replaced with the Plaza Methodist Church. The two gas lamps seen on the corners of the LA Plaza were the first streetlights installed in Los Angeles. Click HERE to see more in Early LA Streetlights. (ca. 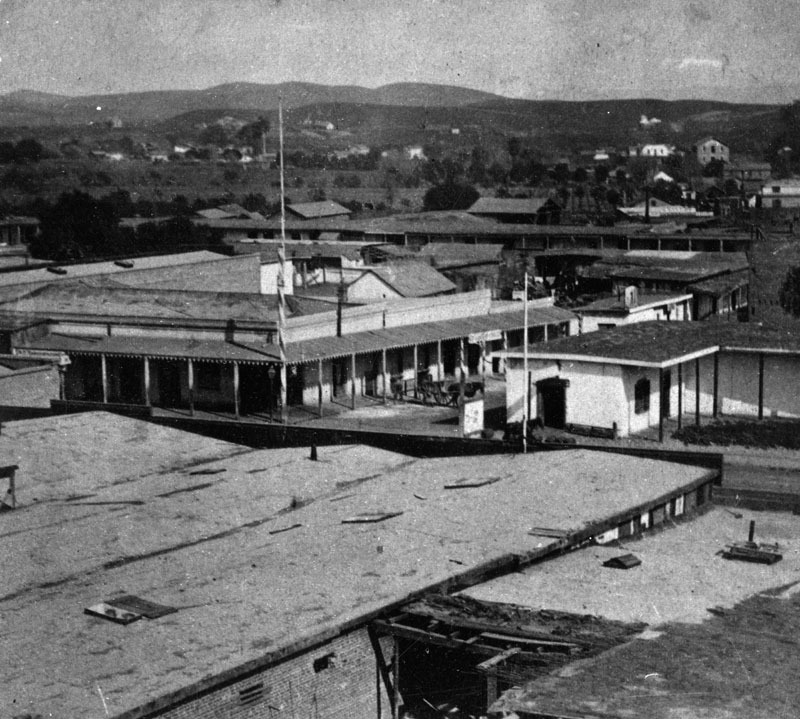 1869)^^ - View of the edge of the Los Angeles Plaza and the entrance to Wine Street (renamed Olvera Street in 1877) looking north from the Pico House. The Avila Adobe is visible on Wine Street. The Olvera Adobe can also be seen on the right. In the foreground running horizontally two fences, a wrought-iron fence and a post-and-rail fence, can be seen on either side of the street. (1850)^** - Map view looking northwest showing the LA Plaza and surrounding area as it appeared in 1850. 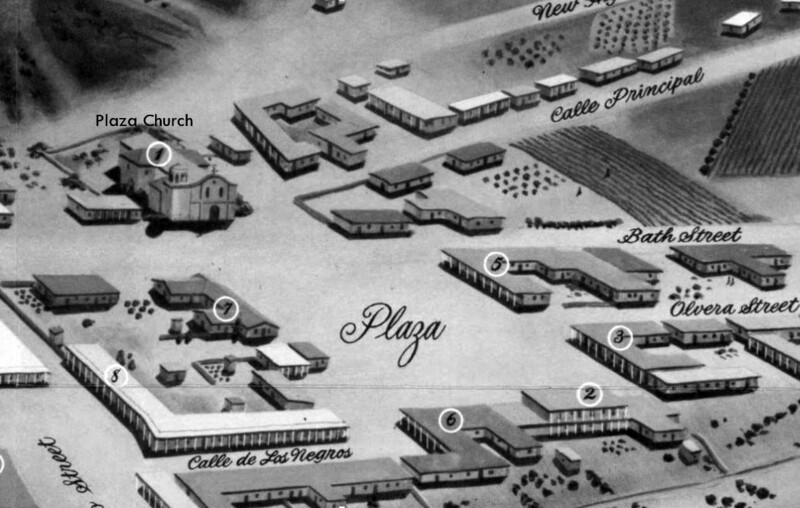 To the right can seen Olvera Street (Wine Street until 1877) at its intersection with the Plaza, with both the Olvera Adobe and Avila Adobe locations marked with an X. The Old Plaza Church is in the upper left corner. 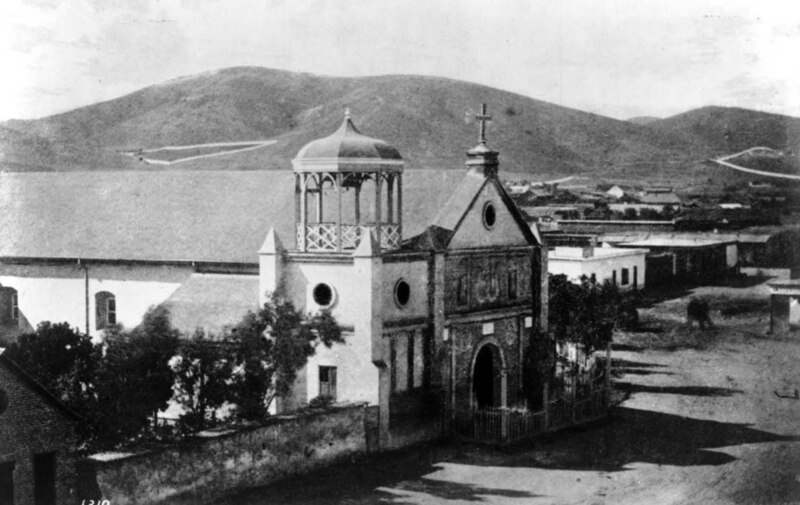 (1869)^^ - View of the 'Old Plaza Church' (Mission Nuestra Senora Reina de Los Angeles) with bare hills in the background. Chavez Ravine, over the church at left, is where Dodger Stadium is now. (1870)^ - Close-up detailed view of the front entrance to the 'Old Plaza Church'. Across the street is the LA Plaza. The 'Old Plaza Church' was one of the first three sites designated as Historic Cultural Monuments by the City of Los Angeles, and has been designated as a California Historical Landmark No. 144. Click HERE to see the complete listing of California Historical Landmarks in L. A.
Click HERE to see more on the Old Plaza Church. 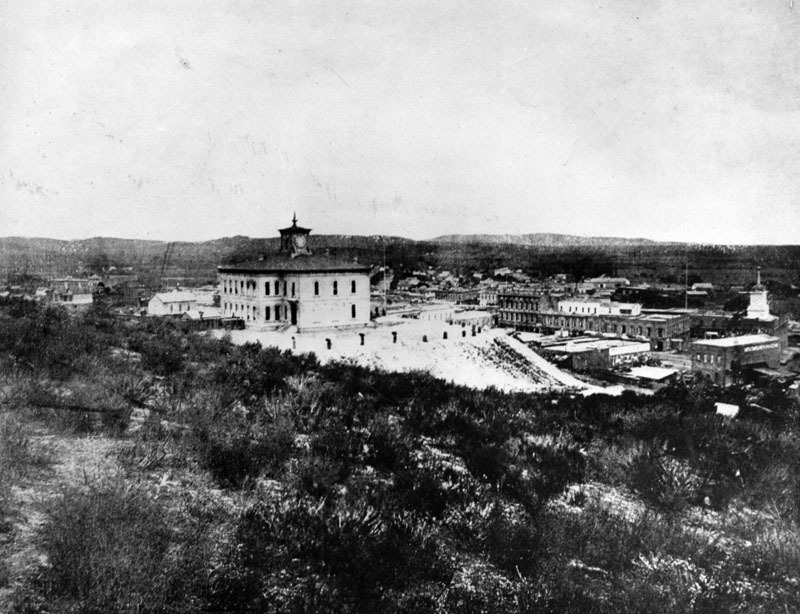 (1869)^^ - View showing the Pico House, Masonic Lodge and the Plaza area from Fort Moore Hill. In the foreground is a community of small houses. Just beyond the community is the Pico House, which faces Main Street. The Plaza is to the left of the Pico House. The Masonic Lodge (or Hall) stands two buildings to the right of the Pico House. A majority of the buildings in view are residential houses. (ca. 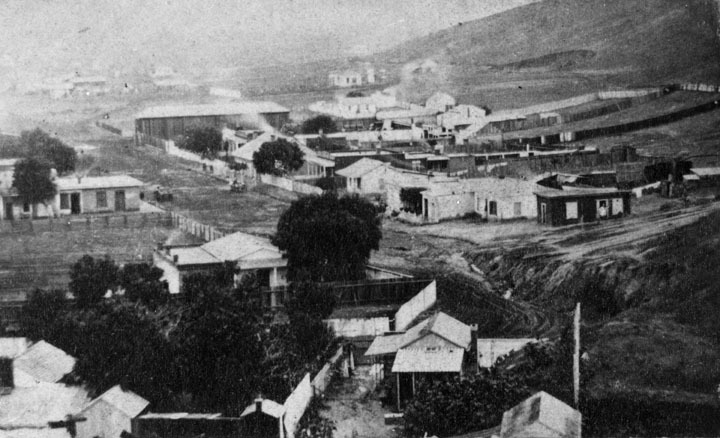 1871)^^ - Photograph of a lithograph of Los Angeles with the LA Plaza and Pico House at center-right. 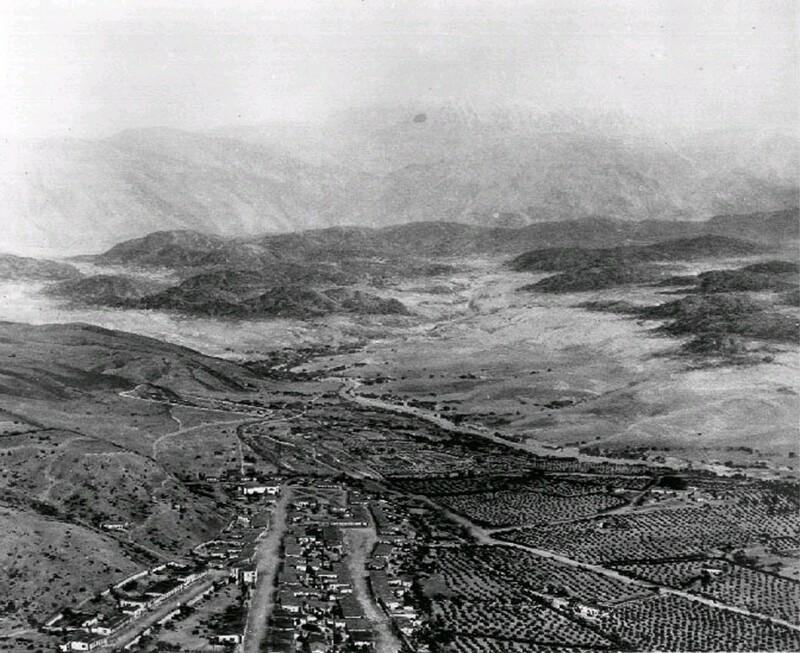 The lithograph shows Los Angeles at an early age where most of the city consists of agricultural land showing orchards and farmland (foreground). Majority of the homes and buildings are clustered closer to the mountains in the background. (ca. 1873)^ - View across the Plaza where three people are posing for the photograph. The Plaza Church and the Cape House Restaurant are seen in the background. In the far background can be seen Fort Moore Hill. Note how the Plaza has taken on a different look (compare to previous photos). In 1969 the water storage tank was replaced with a fountain, the Plaza's shape changed from rectangular to circular, and the grounds were landscaped and made into a public park. This was done by a newly formed private water compnay, LA City Water Co., as one of several conditions they agreed to in return for entering into a 30 year franchise agreement with the City. (ca. 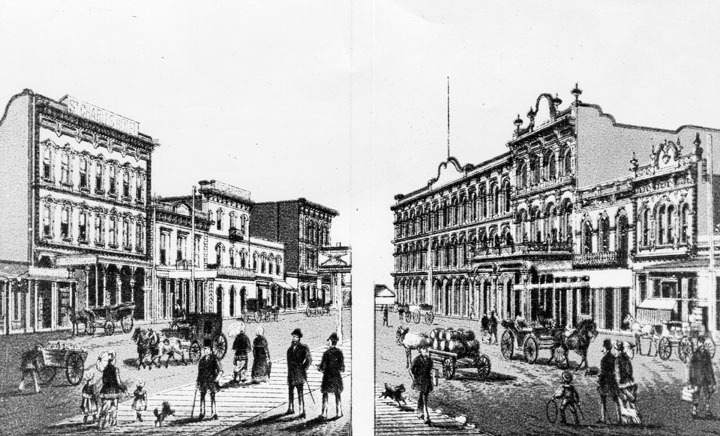 1873)^ - Main Street and Plaza showing the Pico House, the Merced Theater, and the Masonic Lodge. 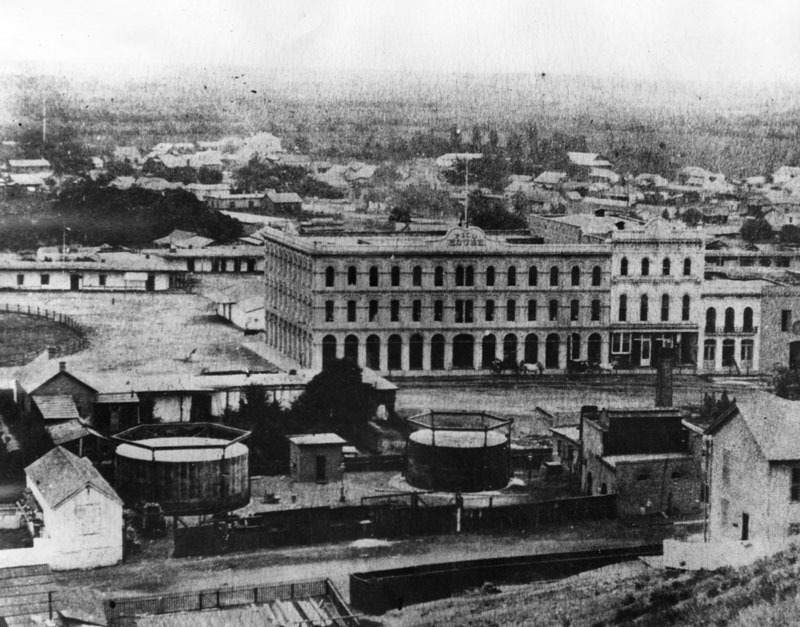 The first gas works can also be seen in the foreground; the tanks were built in 1867, the Pico House and Merced Theater in 1870 and the Masonic Lodge in 1865. The gas tanks were built in 1867 when the LA Gas Compnay (forerunner of Southern California Gas Co.) installed the city's first streetlighting system consisting of 43 gas lamps along Main Street. By 1873, 136 gas lamps provided the outdoor night lighting for the City. Things would change in 1882 when electricity was introduced. Click HERE to see more in Early Los Angeles Streetlights. (ca. 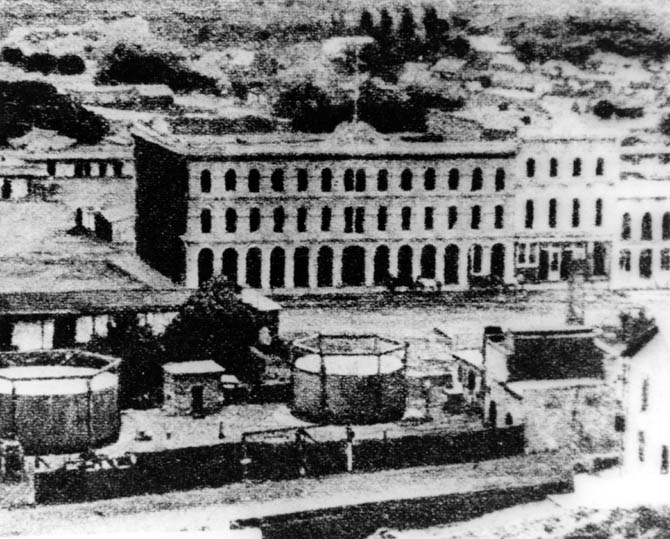 1870s)#*#^ - Close-up view of the Pico House and surrounding area, including gas tanks in the foreground. The gas company's plant, including two large tanks, was located across the street from the Plaza, just south of the Old Plaza Church (see next photo). (1873)#^#* - Ruxton Survey of the Central Pueblo. This oversize plat shows the plaza area in 1873, including the center of town with the early buildings, the Zanja Madre ('Mother Ditch'), the streets in use and the early owners of many of the properties. 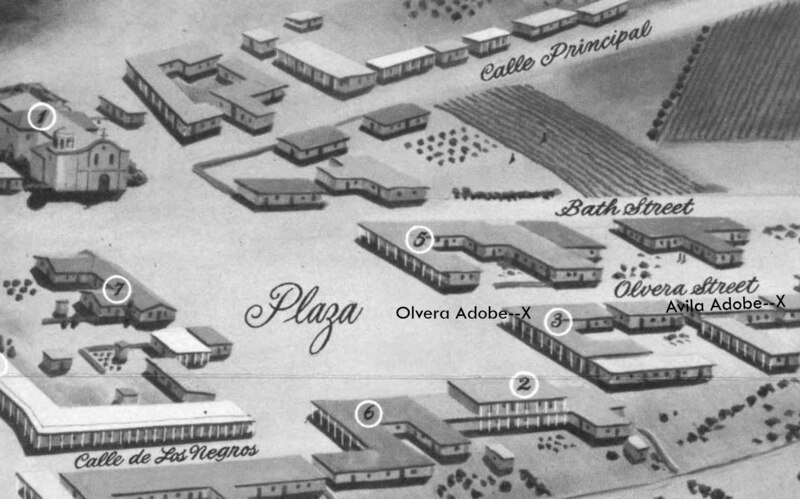 The layout of the plaza itself, however, is shown as it appeared before the change in landscaping in the prior two years before it bacame rounded. 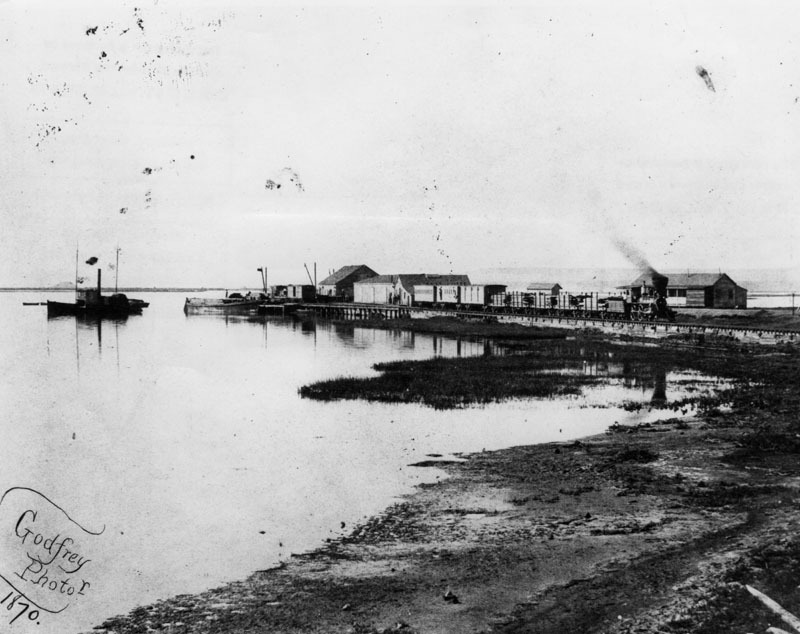 (1800s)^ - View of Timms Point, Los Angeles Harbor. Breakwaters and Deadman's Island can be seen in the background. Railroad tracks shown in foreground. 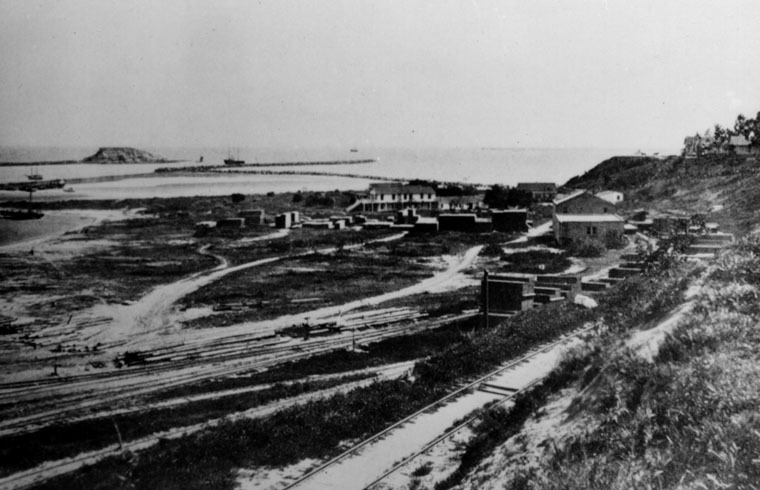 (1870)^ - View of Wilmington harbor in 1870, showing the Los Angeles and San Pedro Railroad, which had been completed by Phineas Banning in 1869--the first railroad to the harbor. Before that, freight was transported to Los Angeles by ox carts and later by horse-drawn wagons. 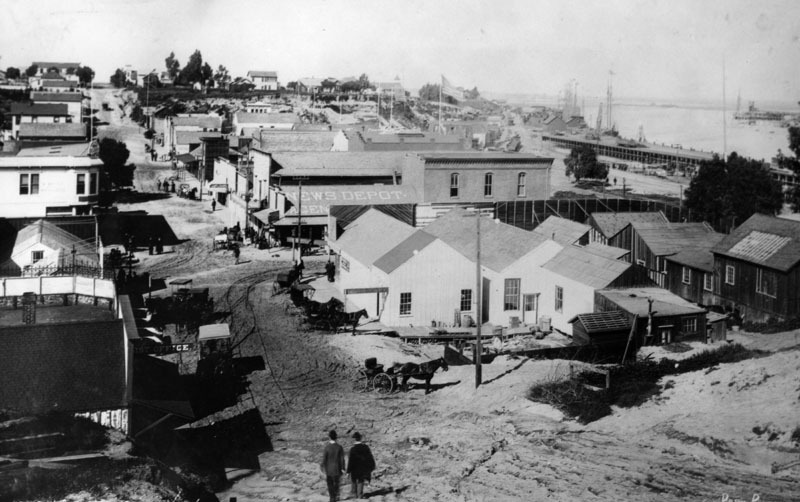 (late 1800s)^ - View of an unpaved road with horses and carriage in San Pedro; in the distance the harbor can be seen. (ca. 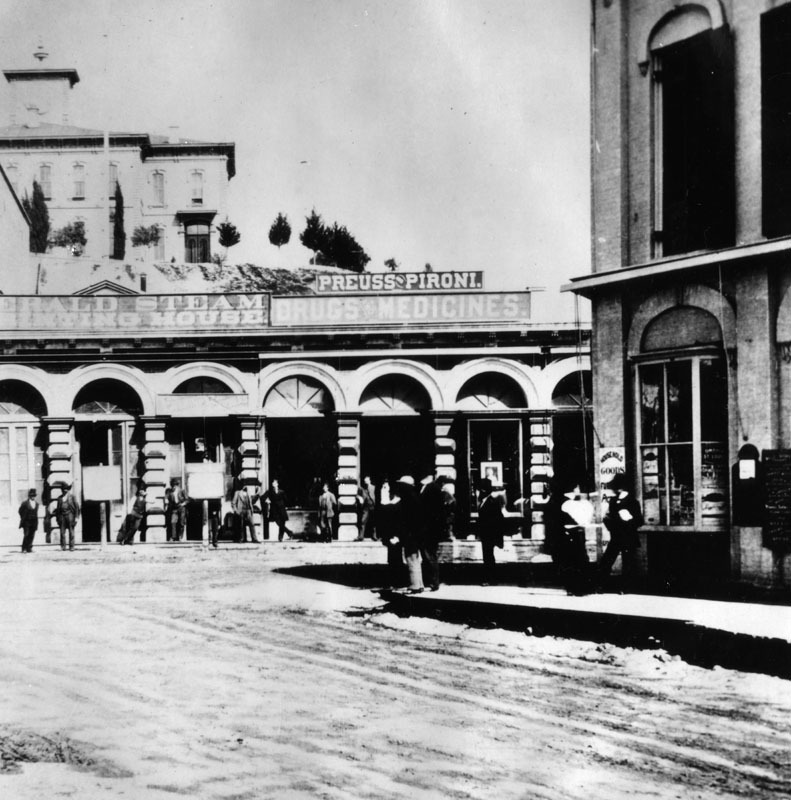 1865)^ - View of the Wilmington Exchange building, hotel and stage station to Los Angeles before the railroad on Canal Street (now Avalon Boulevard). In the front of the hotel is a 4-horse stagecoach with passengers. Besides operating a freighting business, Banning operated a stage coach line between San Pedro and Wilmington, and later between Banning, California, which was named in his honor, and Yuma, Arizona. (ca. 1888)*#* - Shipping in San Pedro circa 1888. Port of Los Angeles. 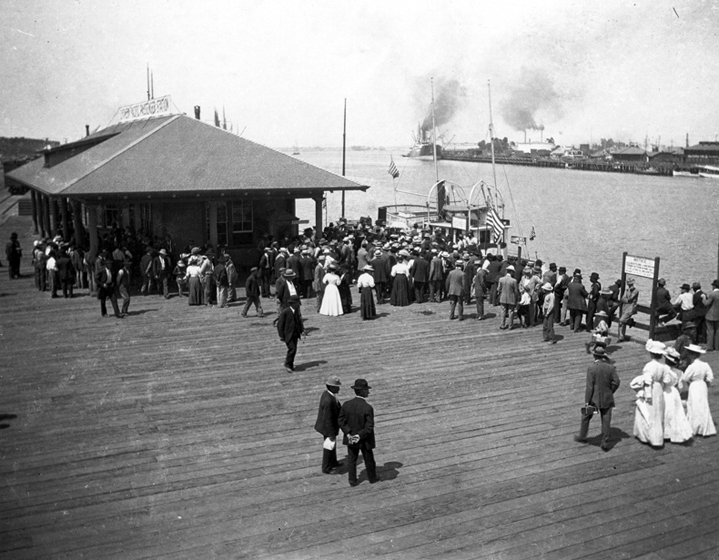 (1913)^ - The Port of Los Angeles in 1913. 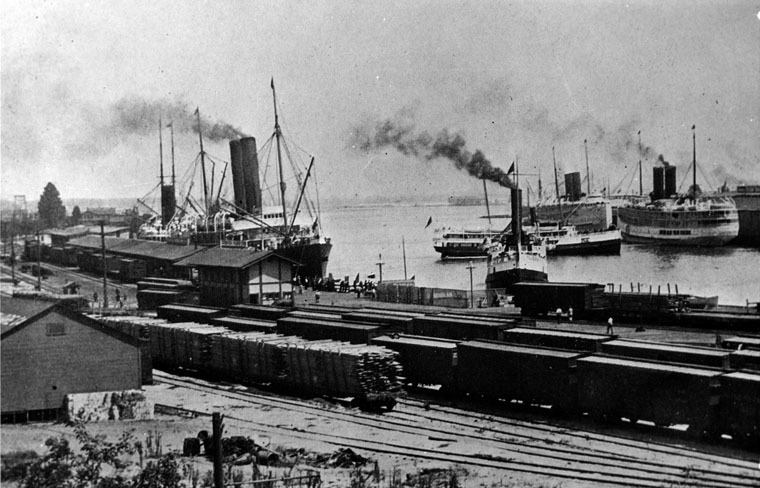 The harbor appears to be filled to capacity with steam ships and train cars full of cargo (This is the same view as previous photo but 25 years later). (ca. 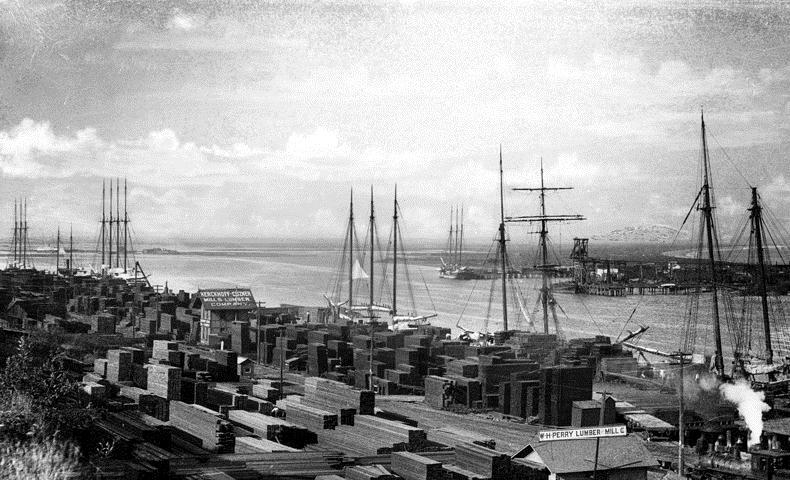 1899)*#* - View of the Port of Los Angeles circa 1899. Crowds of people are dressed up and appear to be viewing the arrival of a vessel. (ca. 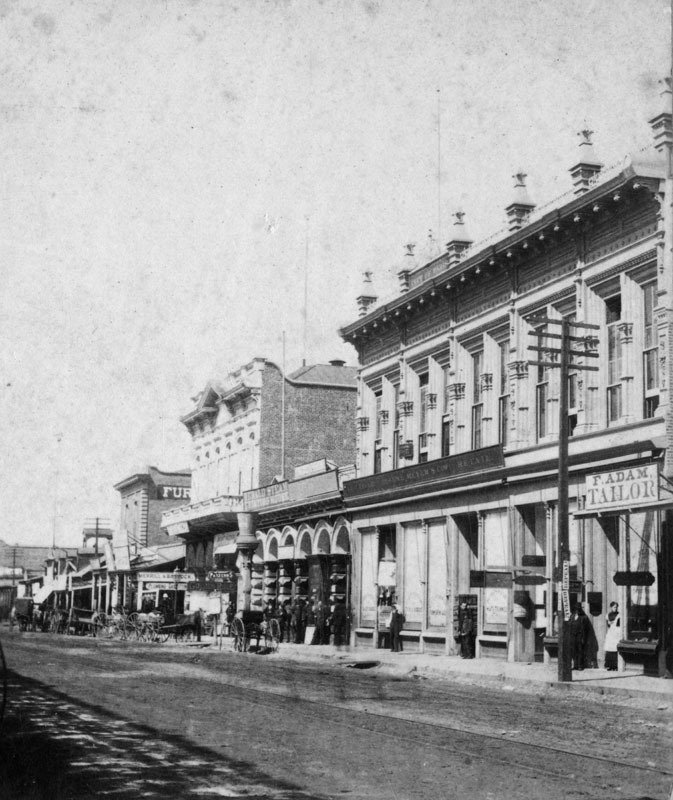 1870)^^ - View of Commercial Street (later Alameda Street), looking east from Main Street. The two-story White House Hotel is seen at far right on the southeast corner of Commercial and Los Angeles Streets. At left is one of the first two-story buildings built in Los Angeles, by I.W. Hellman in 1870. Ducommun Hardware is at the first left-hand corner. This was the business center of Los Angeles at the time. Horse-drawn carriages are in the unpaved street. Charles Louis Ducommun, a watchmaker by training, emigrated to the US from Switzerland in the early 1840s. He started a general store, providing supplies (and credit) to gold prospectors and other pioneers who had settled in the burgeoning pueblo of Los Angeles. (1870s)^ – View showing Don Abel Stearns' Arcadia Block, the first brick business building in Los Angeles, later demolished for the #101 Freeway. Numerous horse-and-buggies are parked in front. 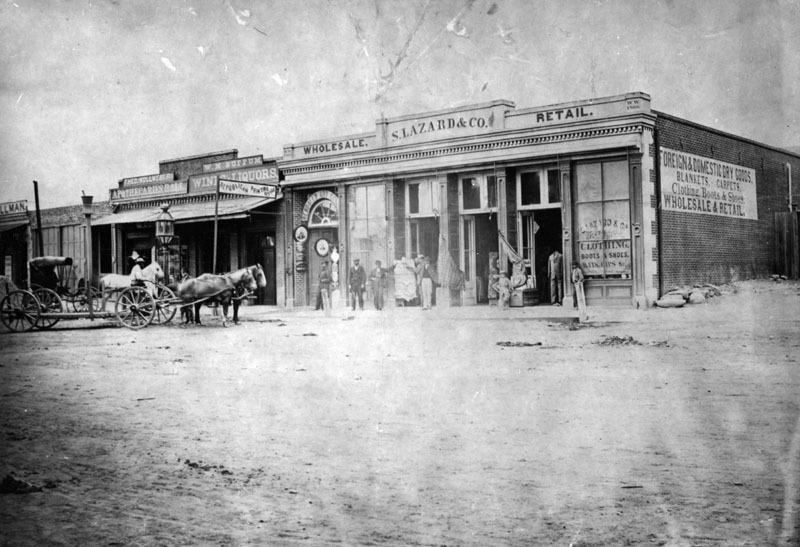 In 1858, Abel Stearns constructed a two-story business block on Los Angeles Street and called it Arcadia Block after his young bride, Arcadia. 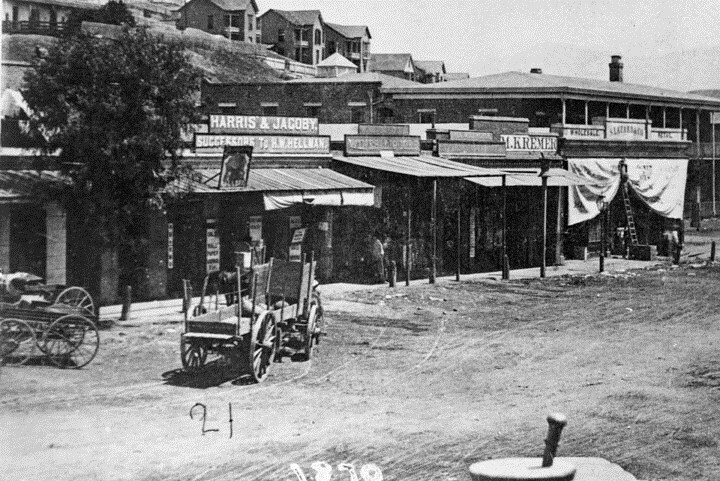 (1870s)^ - View of the west side of North Los Angeles Street, between Commercial and Arcadia, streets. The Samuel C. Foy Leather Depot stands in the center-right. In the far left is I.W. Hellman's building, one of the first two-story buildings in Los Angeles. Isaias Wolf Hellman was a German-born American banker and philanthropist, and a founding father of the University of Southern California. (1860s)^ - Exterior view of S. C. Foy saddlery shop, housed in a one-story, brick building with a portico. The store sign reads "Saddle & Harness Maker, Leather Depot" and has a silhouetted prancing horse on top. Tack and saddles are displayed on the front and several men are posing for the camera. (1871)^ - View of the corner of North Main Street at Arcadia Street in the Plaza area in 1871, showing at right the residence of the wealthy merchant, trader, and government official, Don Abel Stearns. This residence was a virtual mansion at the time, with fourteen beautifully-decorated rooms. It was the social center of the pueblo. Later it became the site of the Baker Block. 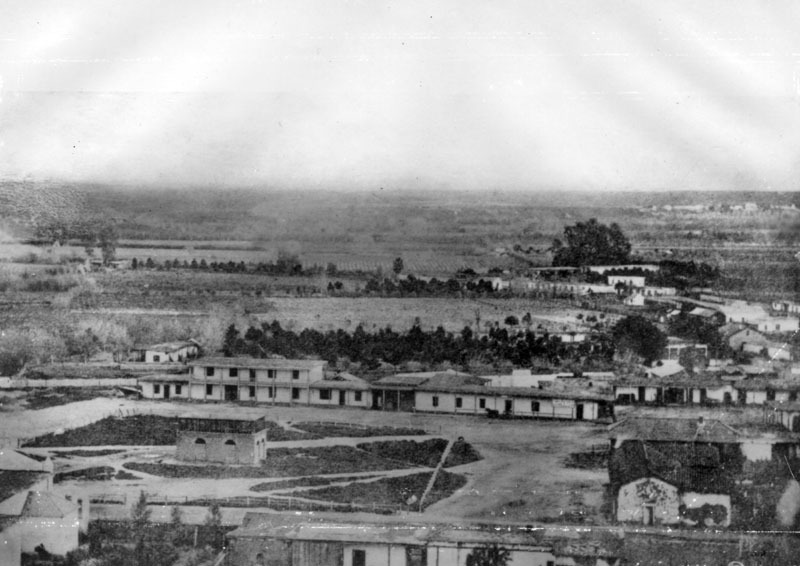 A number of low-lying adobe and brick buildings are seen in this panoramic view. 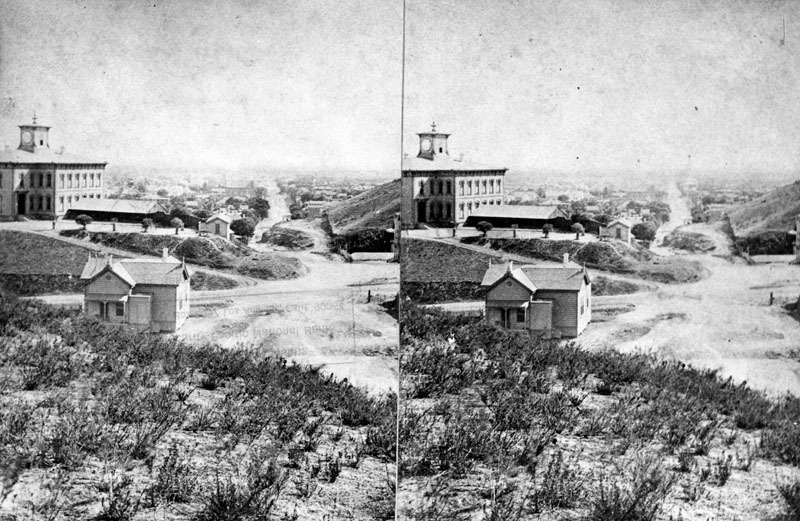 (1868)+^ - Composite panoramic view looking southeast showing Los Angeles’ 1st City Hall & Jail at center-right. John Temple's 1858-built Clocktower Market/Courthouse building is on the left. Click HERE to see more views of Los Angeles' First City Hall and Jail. (ca. 1869)^^ - Left panel of a panoramic photograph/sketch of downtown Los Angeles looking southeast from Bunker Hill with each property annotated and listed at top. The photographer, S. A. Rendall, can be seen standing in his own photo (#14). (ca. 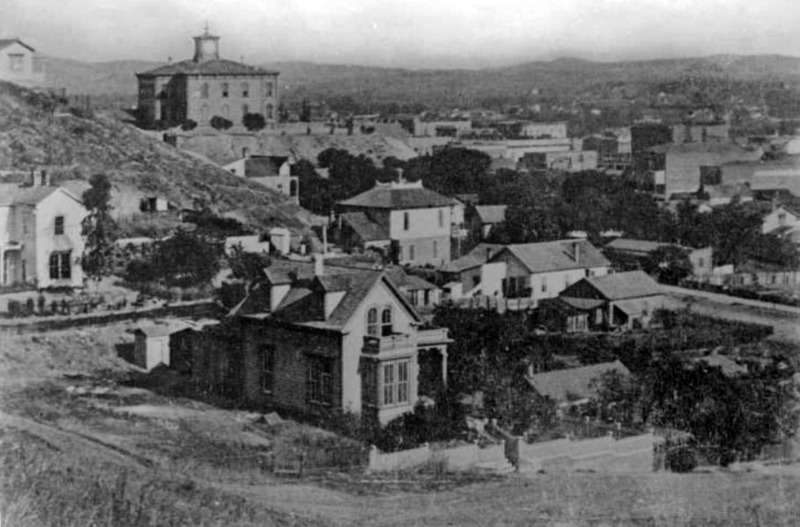 1869)^^ – Closer view of S. A. Rendall standing on the hillside with the St. Athanasius Episcopal Church (First Protestant Church in LA) directly below him at center (No. 8). 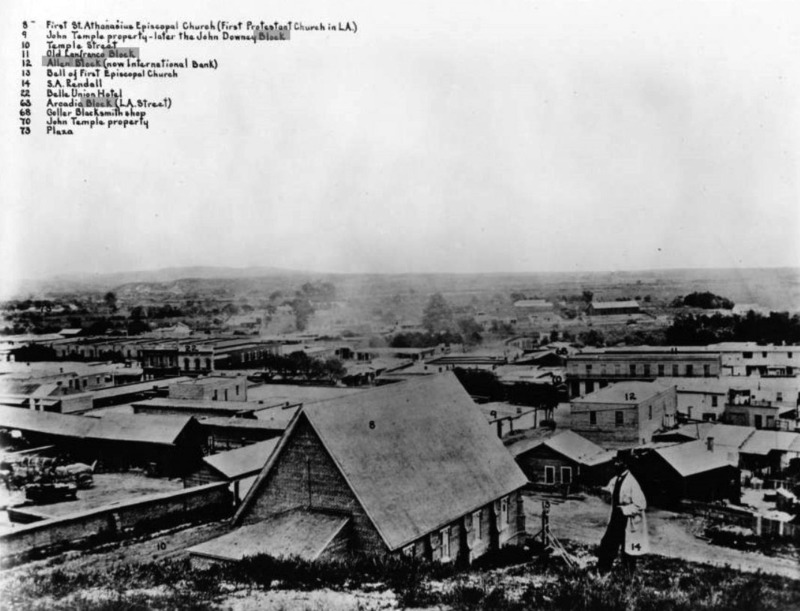 (1869)^^ – Closer look at the left panel of Rendall’s panoramic view of early Los Angeles as seen from Court House Hill showing the Griffin and Tomilson Lumber Yard at lower-right. (ca. 1869)^^ - Right panel of a panoramic photograph/sketch of downtown Los Angeles looking southeast from Bunker Hill with each property annotated and listed at top. 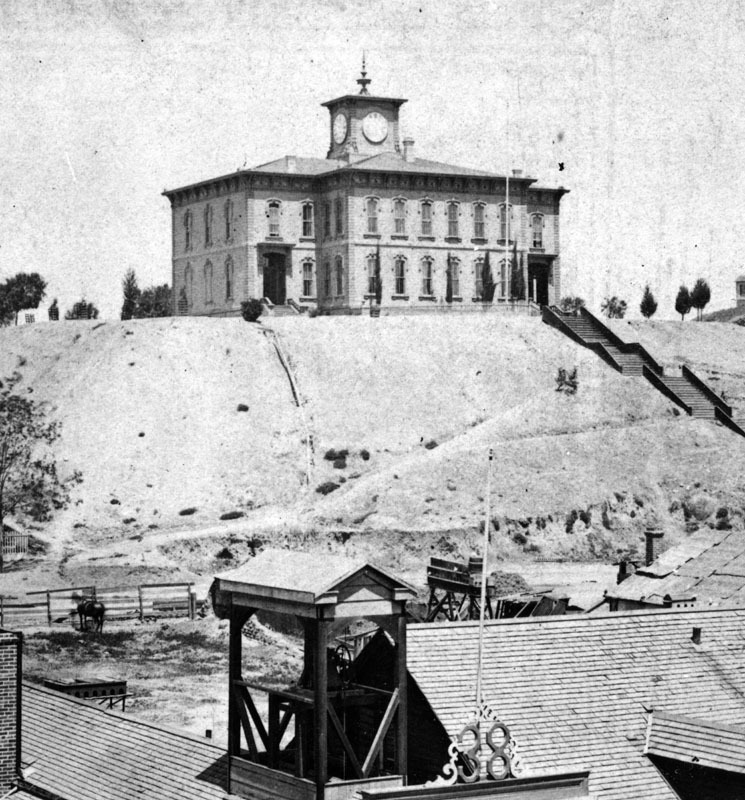 The location of the camera was at the top of a hill called ‘Poundcake Hill’ the future site of Los Angeles High School (1873) and the 2nd L.A. County Court House (1891). (1871)^^ - Photograph of a drawing by E.S. 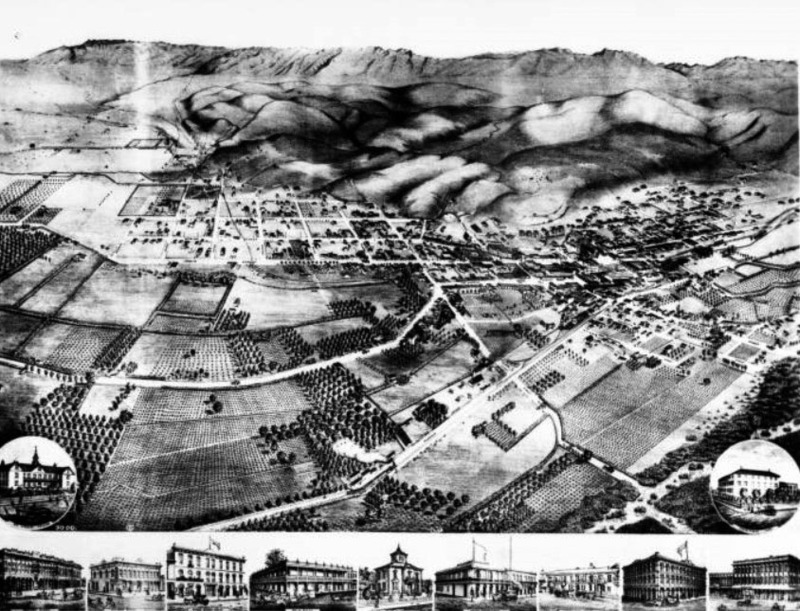 Glover depicting Los Angeles looking West, including an inlay of individual buildings in detail at bottom. The city is shown from above, the first major street visible being Alameda Street along the bottom edge. To the right, First Street runs perpendicular to this. The hills are visible in the distance, while along the bottom of the main image, a collection of nine smaller images depict buildings of interest in detail. Two more of these buildings are inlaid at either bottom corner of the main image. 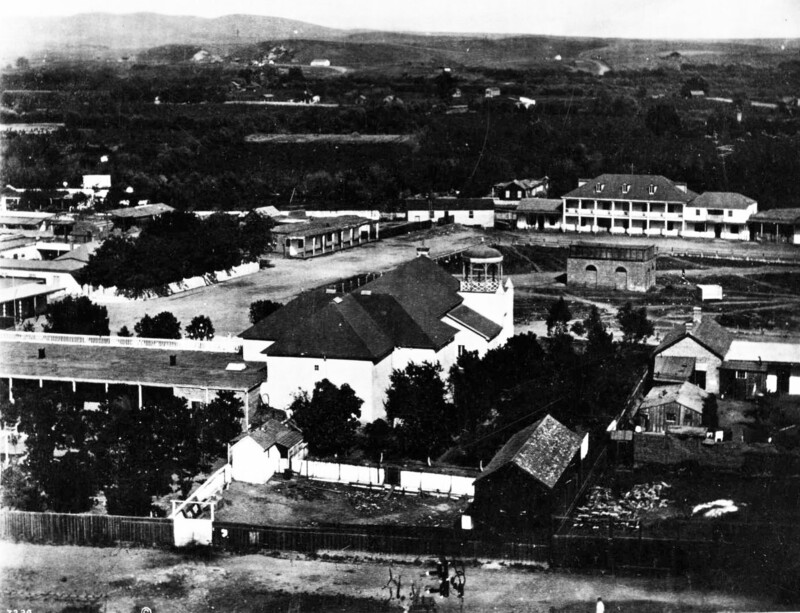 The buildings from left to right include: St. Vincent's College, Downey Block, Hellman Block, Bella Union Hotel, Bells Block, Residence of W. Woodworth Laur, the United States Hotel, the Lafayette Hotel, Pico House, Temple Block and Charitable Institute. 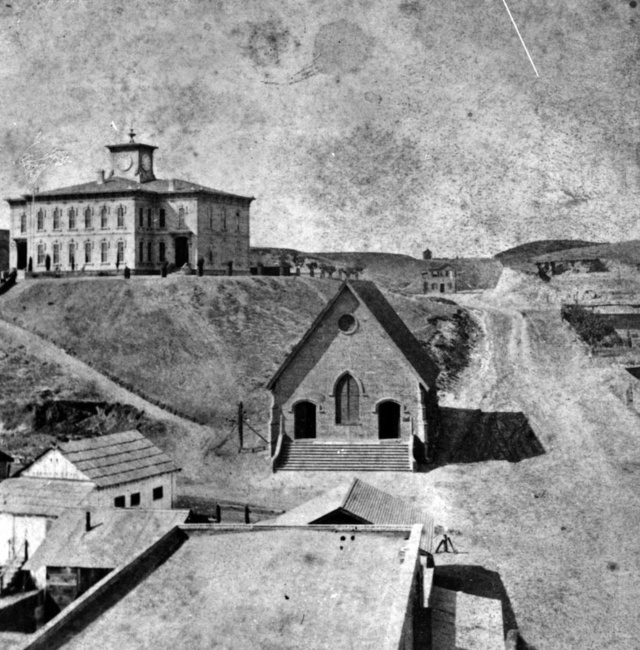 (1873)^ - Old Los Angeles High School, looking east from the hill on North Broadway at Court Street. The building in the center, occupying the 2nd site of the County Court House (1891-1932), is the old school house. The Temple Block stands to the right of the school. Broadway, first known as Fort Street, was cut through the bushes in the foreground. 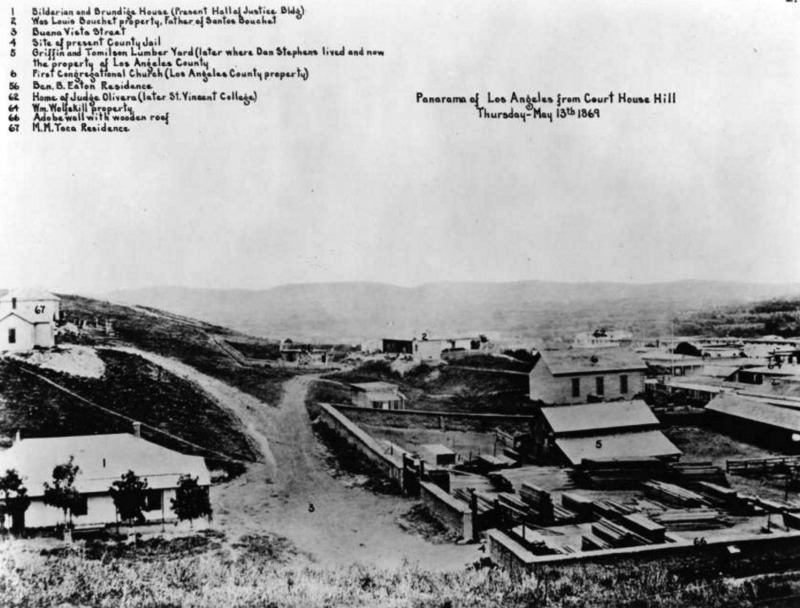 Construction on Los Angeles' first high school, which was also the first and only one in Southern California for a number of years, began on July 19, 1872, at the former site of Central School on what was then known as Poundcake Hill. It was located at the southeast corner of Fort Street (later Broadway), which the front of the school faced, and Temple Street, with the back of the school to New High Street (later Spring Street). As it was on the hill, a few hundred feet from the streets below, steep wooden stairways led up to the schoolyard. (ca. 1870s)^ - The first Los Angeles High School was built in 1873, with Dr. Lucky as principal. The corner stone was laid July 19, 1872. Cost was $19,000. A horse can be seen standing by a fence in the left foreground. (ca. 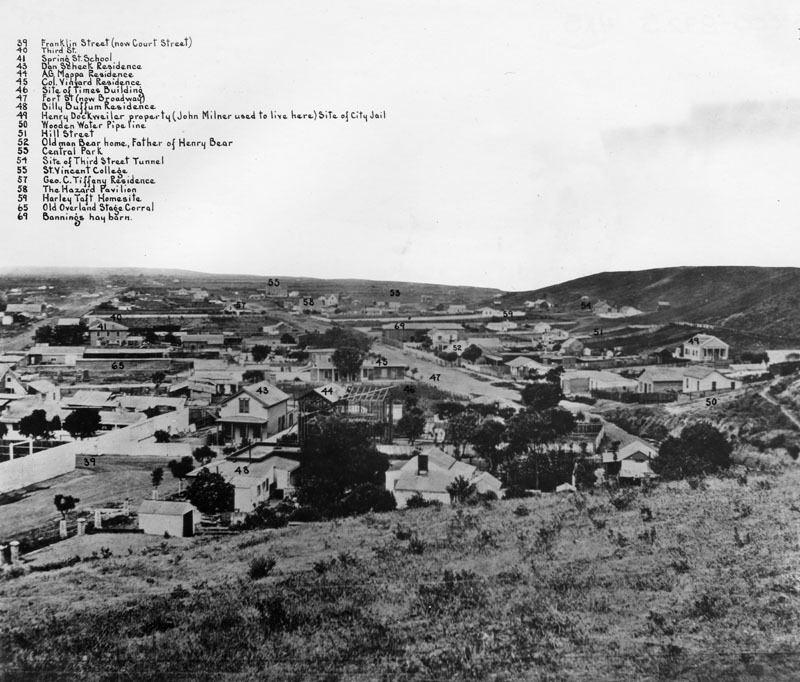 1874)^^ - Los Angeles High School atop Poundcake Hill, circa 1874. The St. Athanasius Episcopal Church can be seen in the center of the photo. 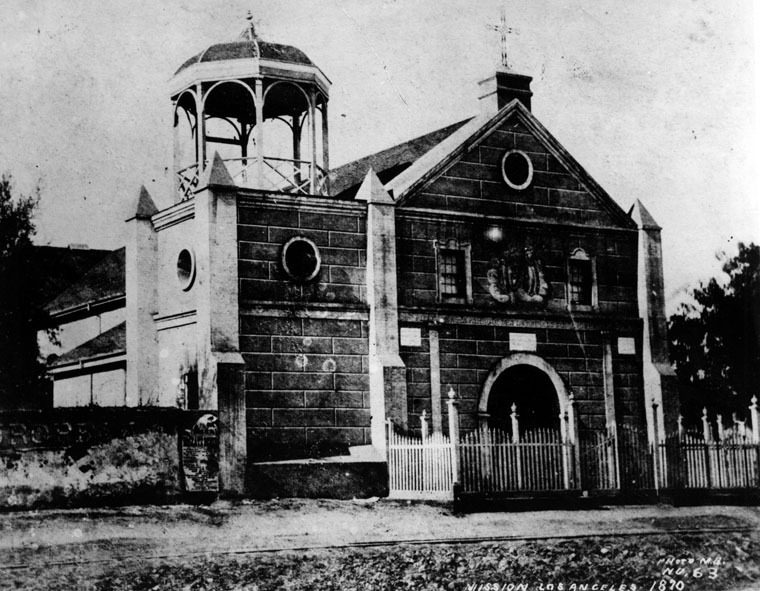 Click HERE to see more Early Views of the St. Athanasius Episcopal Church. (ca. 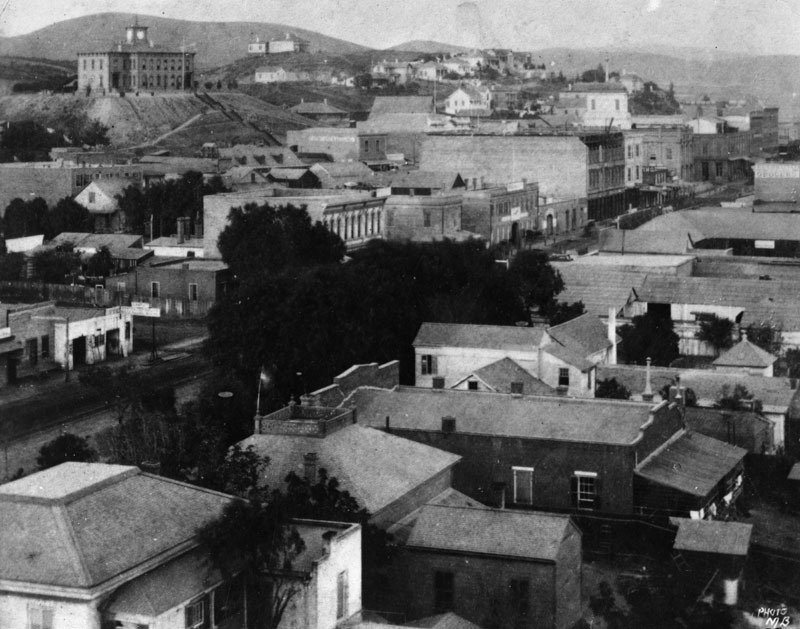 1875)^ - Main and 1st streets looking northwest, showing buildings in foreground and Los Angeles High School on hill in the upper left. (1875)^ - View of Court Street looking west toward North Spring Street in 1875. Seen is what seems to be a printing house, and the Preuss-Pironi Drugs & Medicine store. Behind on the hill is the original Los Angeles High School. (1875)^ - View of Spring Street near Court Street. On thie right is F. Adam, Tailor; and the top of the building has sign "City of Paris?" Los Angeles High School sits on the hill (Poundcake Hill) behind these buildings. (ca. 1875)^ - Stereoscopic view of Fort Street (later Broadway) looking south from Fort Hill, at Temple Street. Los Angeles High School sits on the hill on the left. (ca. 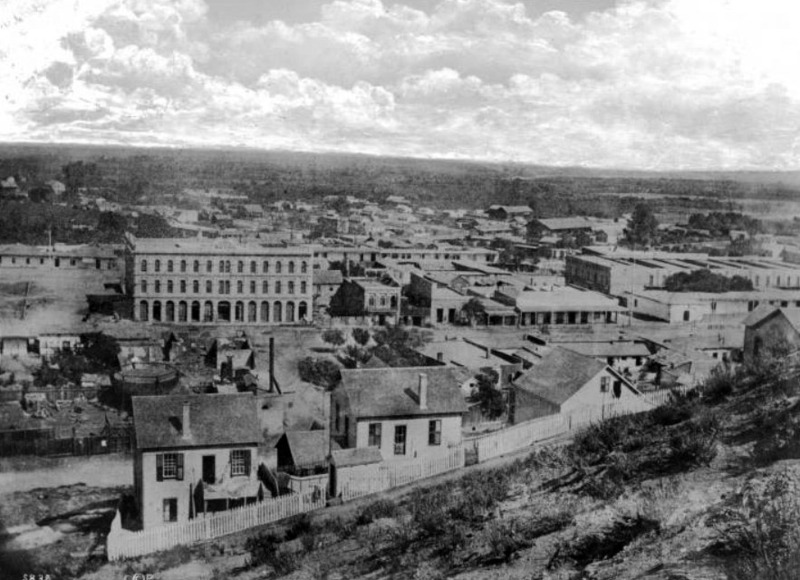 1878)^^ - Panoramic view of Fort Street (later Broadway) from the edge of Bunker Hill as seen from First Street and Hill Street, looking northeast. At center, a group of at least six buildings can be seen with some type of vegetation between some of the homes. (ca. 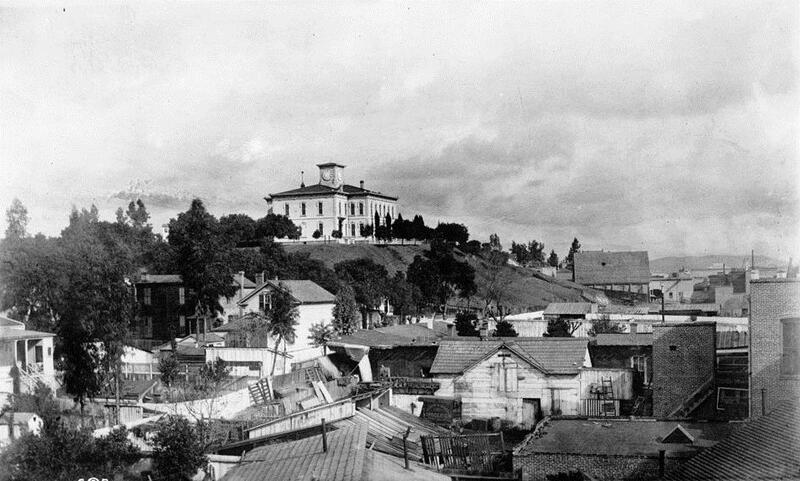 1883)^^ - View of Los Angeles High School atop Fort Moore Hill taken from the Nadeau Hotel on 1st & Hill Street. 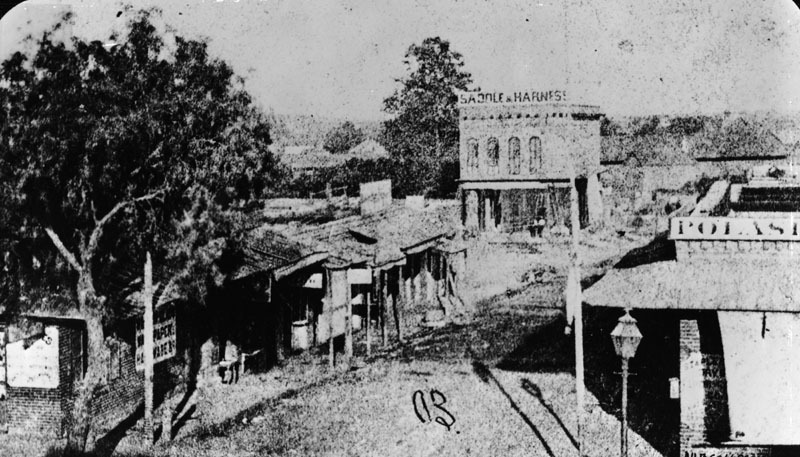 (1871)^ - View of North Main Street, looking north from Temple with the Downey Block on the N/W corner (left). On the far right hand side is the last building of the Bella Union Hotel. A multitude of horse-drawn wagons are seen in the congested foreground. (ca. 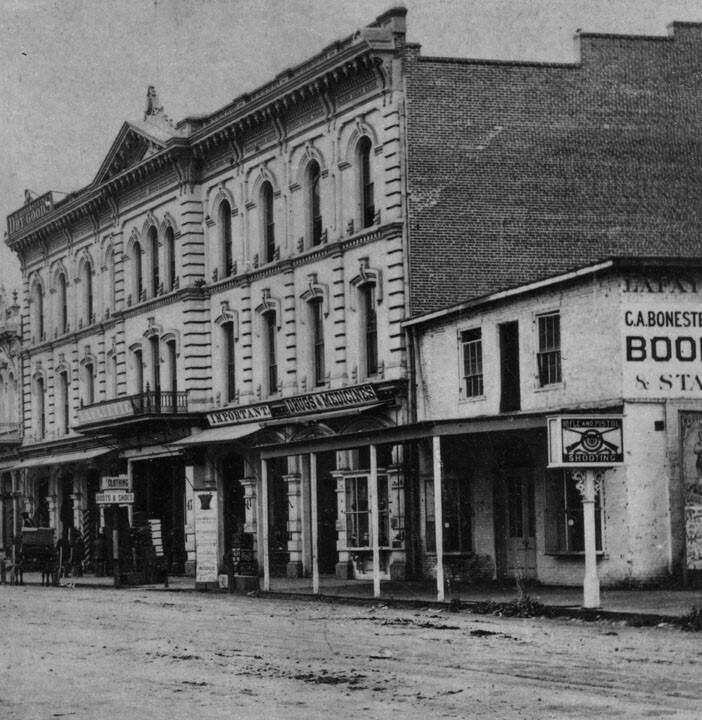 1870)^ - View of North Main Street taken after erecting Pico House, but before completion of Merced Theater. The Bella Union Hotel can be seen at right-center of photo. (1871)^ - A 4th of July parade on North Main Street of the Veterans of the War of 1812. 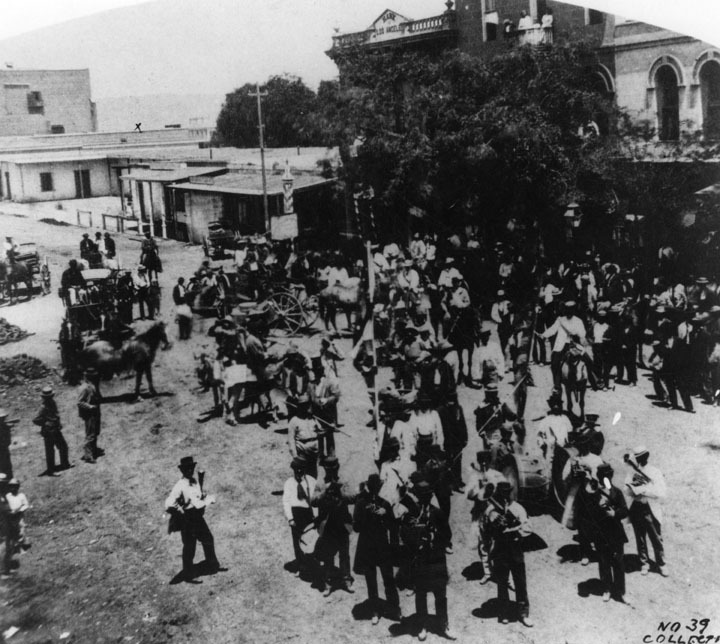 Men are seen in two lines standing in the street, horses and carriages waiting and people on the sidelines. The Bella Union Hotel in the background is partially obscured by trees. 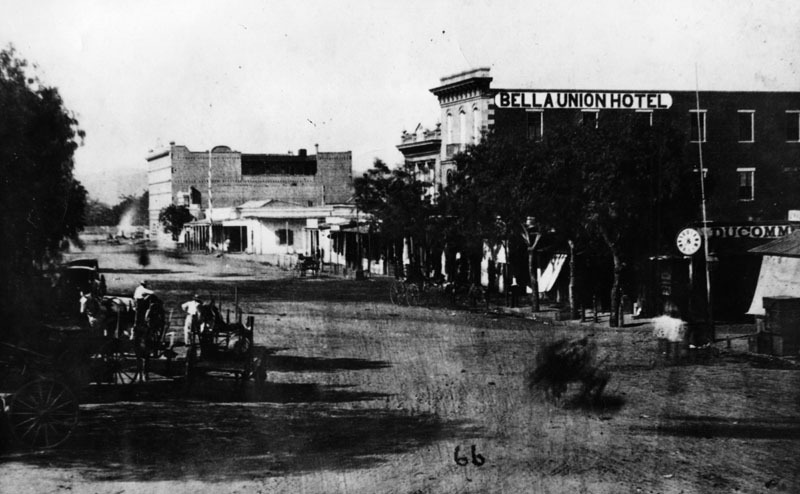 The Bella Unioin Hotel site was designated California Historical Landmark No. 656. Click HERE to see more in Califronia Historical Landmarks in LA. 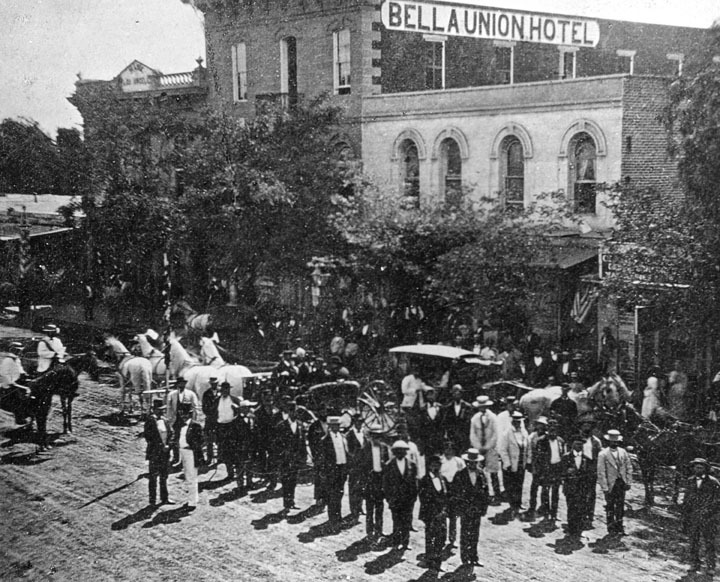 (1871)^ - View shows a 4th of July celebration in the street in front of the Bella Union Hotel. A crowd is gathered, some standing, some on horses, or in carriages, several playing instruments. The Bella Union Hotel in the background is obscured by trees. 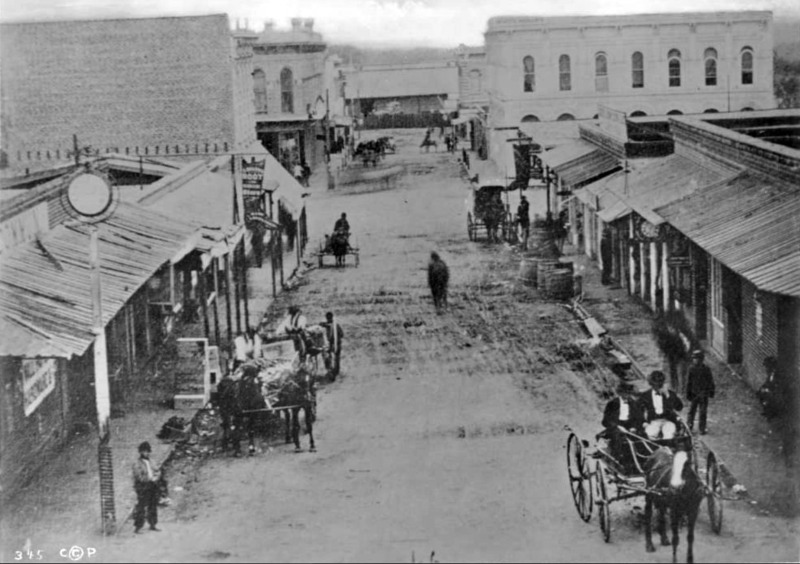 (1870s)^ - Rendering of how the Main Street scene was in the 1870's. On the left, the St. Charles Hotel, originally the Bella Union Hotel. The Bella Union became the Clarenden in 1873 and the St. Charles in 1875. On the right, rear of Pico's Building, which was the original home of the Farmers and Merchants Bank, later merged into Security Pacific Bank. Next to Pico's Building are the Merced Theatre and Masonic Lodge #42. (ca. 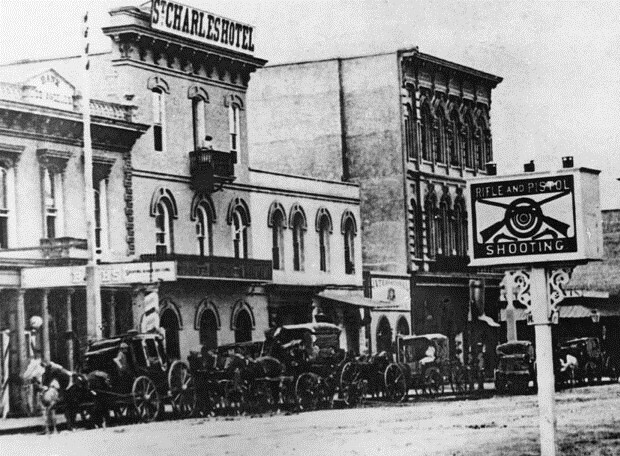 1875)^ - View looking southeast on the 300 Block of N. Main Street showing the St. Charles Hotel, originally the Bella Union Hotel. Horses and buggies are lined up along the street. In the foreground a sign reads, “Rifle and Pistol Shooting,” a reminder that Los Angeles was a Western frontier town. (ca. 1875)* - Exterior view of the St. Charles Hotel (Slightly different angle than the photo above). (ca. 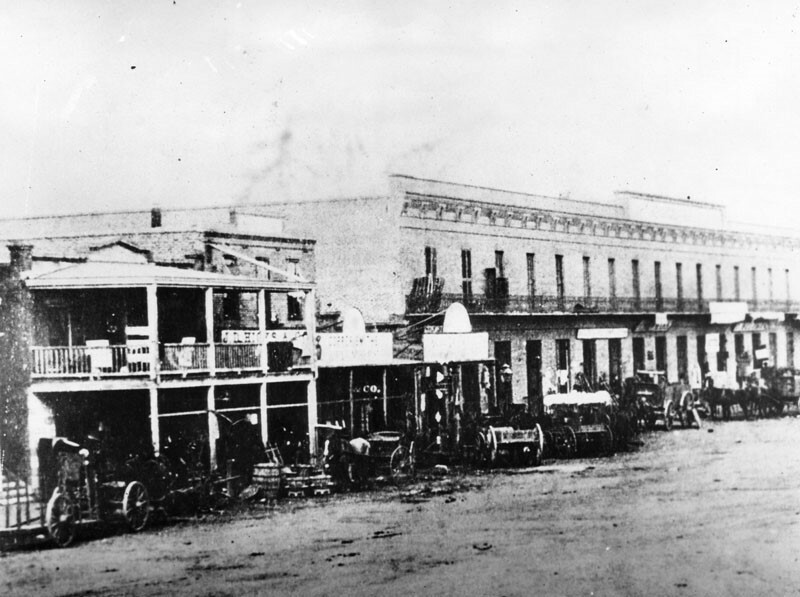 1870s)^ - View of the Lafayette Hotel, located on the west side of Main Street opposite of the St. Charles Hotel. The same "Rifle and Pistol Shooting" sign can be seen here but from a different angle. (ca. 1880)^ - Closer view of the La Fayette Hotel. Several men sit and stand in front of the hotel entry way. 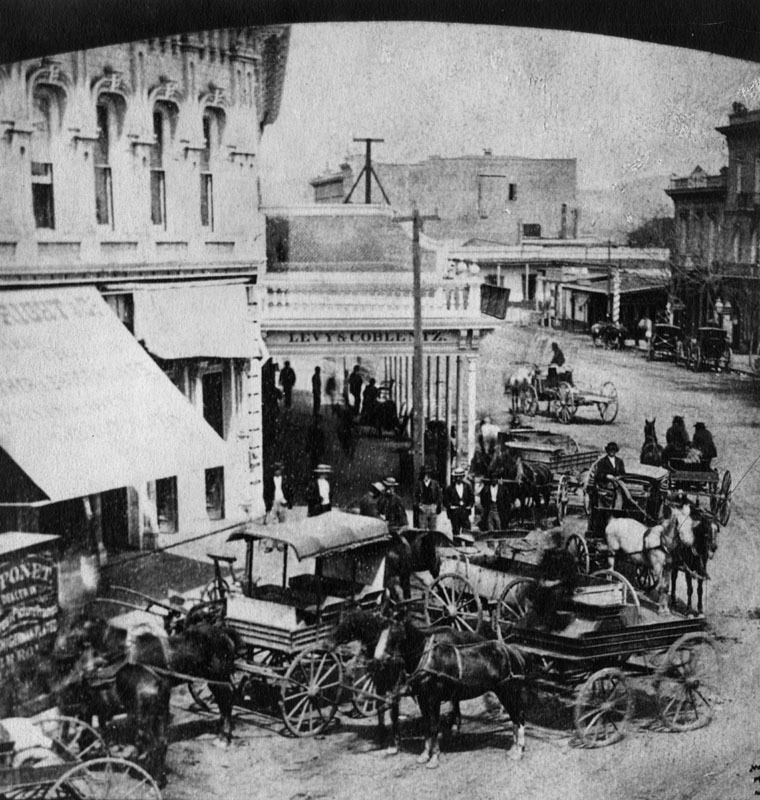 The street is unpaved and two horses and carriages are seen in front of the building, one near the "Insurance and Real Estate" sign.